There was a fair amount of discussion generated last week when Bolivian president Evo Morales gave Pope Francis a crucifix depicting Jesus crucified on a hammer and sickle. This crucifix had been made by a radical Spanish Jesuit priest named Luis Espinal who was killed in 1980 in a political assassination during the unrest after the fall of the military government of Bolivia. Not surprisingly, many people considered the combination of the symbol of communism -- an atheistic and oppressive ideology which has been espoused by governments responsible for around a hundred million killings over the last century -- with the symbol of Christianity to be offensive, and there was a certain amount of discussion as to whether Pope Francis considered the gift offensive. Some held that in photographs and video the pope looked taken aback at the gift, and people also argued that one could hear him say in a low voice "that is not right" as he was given the present. However, an enterprising reporter asked the pope about the gift during the flight back to Rome, and Pope Francis professed himself un-offended. Francis's description of the piece as protest art, and his comparison to a piece showing Christ crucified on a bomber, is interesting, though I have to say that the example he gives strikes me as rather different. 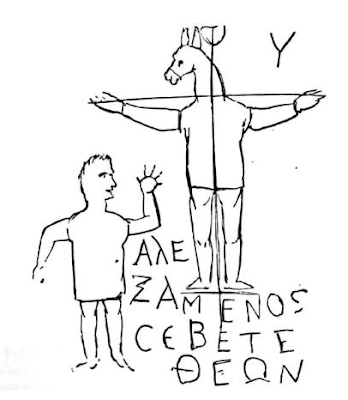 Showing Christ crucified on a bomber seems to suggest a message that the bomber is a tool of execution and torture used by an imperial power, just as the cross was in fact a tool of execution and torture used by the Roman Empire. Indeed, an interpretation along these lines did strike me as soon as I saw pictures of this "Marxist crucifix": There's something in a little way appropriate in making an analogy between the cruel violence of crucifixion and the cruel violence which communism visited upon the world, including upon many Christians. But as the pope says, Espinal was a believer in a heavily Marxist approach to Christianity, and Evo Morales is himself an avowed socialist, leader of a political party named Movement for Socialism (MAS). Clearly, the intent of the original sculptor of the piece, and Morales in giving it to Francis, was not to suggest that communism crucifies Christ. Rather, it seems clear that the intent is more to suggest that socialism is an instrument of salvation, just as the cross, and Christ's suffering and death on it, was the instrument of our salvation. What this helps to underline is the curious place which the cross holds in our Christian iconography, one which is so familiar to us that we forget how strange it is. We believe, after all, that Jesus, true God and true man, was falsely accused by his own people and unjustly executed by the state. The cross was a horrific means of execution, one which often caused people to suffer publicly for days before finally dying in agony. As such, the cross was a grisly and shameful symbol, and for our sins, our savior was put upon one and to suffer and die. Sometimes a persecuted group will take a symbol of persecution as their own in order to make a point. For instance, in the Vietnam novel Matterhorn, several black soldiers make a point of wearing nooses make of cord around their necks as a reference to lynching and an accusation of racism against those around them. That is now, however, how Christians view the cross. Our use of the symbol is far more radical, and shows how seriously the Church takes the idea that salvation was won for us through Christ's suffering and death: we have adopted this instrument of death and cruelty as a thing of beauty. It did not happen all at once. In the Christian art from the era of persecution, there are very few portrayals of the cross. Indeed, one of the earliest depictions linking the cross with Christianity is a piece of apparently anti-Christian graffiti carved in a plaster wall in Rome around 200 A.D., the Alexamenos Graffito, which portrays a man standing before a crucified man with the head of a donkey, captioned "Alexamenos worships his god". Clearly, the graffiti artist thought that for a god to be crucified was shameful, and for someone to worship a god who had been crucified was foolish. Christians may not have agreed, but in their art of the period you are more likely to see the chi rho symbol, the fish, the shepherd, or depictions of the last supper than any kind of crucifixion scene. However, after Emperor Constantine legalized Christianity and banned crucifixion, and his mother St. Helena discovered the relics of the true cross, which became a site of pilgrimage, depictions of the cross and the crucifix began to appear in Christian art. Today there is no symbol more identified with Christianity than the cross. We have made something once at least as shocking as the gallows or the guillotine the symbol of our faith, and we have done so not our of protest or irony, but because it is through this suffering that we are redeemed. That is why Espinal and Morales both saw a crucifix depicting Christ nailed to a hammer and sickle as something which suggested Marxism was a positive thing, rather than a thing of cruelty and suffering. And it is why I would disagree with the Holy Father and find the crucifix offensive. Perhaps the Holy Father has a far greater ability to put himself in the place of others than I. Perhaps his background in Central and South America, provides a different perspective than a grounding in European history, where the killing fields of communism are rivaled only by those of communism in Asia. Perhaps both. I think the message of the art is clear: Marxism saves. It takes the strange, scandalous new message which Christianity has applied to an ancient instrument of killing, and substitutes the symbol of Marxism to say: By this sign, your salvation comes into the world. But in fact, Marxism kills. It has killed scores of millions. hi!,I like your writing so so much! share we communicate extra about your article on AOL? I need a specialist in this house to unravel my problem. Maybe that's you! Having a look forward to look you. I'm not really sure I buy the garage door angle on this one. It's usually not a sign of suffering, but of prosperity. AOL might be a sign of suffering, these days. But the unraveling of problems should be pretty high on our list of things to do to problems, and we all should look forward to looking. I just don't think that being Latin American is an excuse for supporting communism any more than it is an excuse for supporting Nazism. As you point out, communism has killed a hundred million people. It has created misery and want wherever it has been tried. Why do people keep on trying it? I think that Aleksandr Solzhenitsyn had the answer: " More than half a century ago, while I was still a child, I recall hearing a number of older people offer the following explanation for the great disasters that had befallen Russia: Men have forgotten God; that’s why all this has happened. I feel that I need to add that I know that the Pope believes in God! My quotation was really about the people who think that communism offers a good solution to the world's problems. But I think that the pope is imprudent in his judgments about communism. Popes are not infallible in prudential judgment; they have made many mistakes in judgment in the past, even the best of them, and of course they may also be mistaken in matters of fact. Remember Rex Mottram: "It would be sort of raining spiritually, only we are too sinful to see it." Oh dear. I don't know what to think. I can understand such a piece of art as expressing the idea that Marxism crucifies Christ, or Christ identifies with the victims of Communism just as the analogy with the bomber says that with our wars we contribute to Christ's suffering in the innovent victims of the war, but still... Communist symbols are just as offensive to survivors of Communist dictatorial regimes as Nazi symbols are to Holocaust survivors. I wonder who would have the courage to even create a crucifix where Christ is on a swastica symbol, much less to publicly present it to the Pope. In my country there is Cardinal Mindszenty and Bishop Zoltan Meszlenyi who are canonized victims of Communist oppression, but also there is ongoing canonization process for several priests and nuns in fact murdered by the dictatorial regime, and all the suffering I know about from friends, family, priests and others who were victims. I was even yesterday in a monastery, at the tomb of the priest who was (last of the imprisoned priests) freed from prison in 1971, Edmund Lenard. I hope no one is trying to rewrite history and delete their sufferings and martyrdom from human memory. And this is even if I disregard your more disturbing analysis that this piece in fact substitutes Marxism for the Redemption of the Cross. 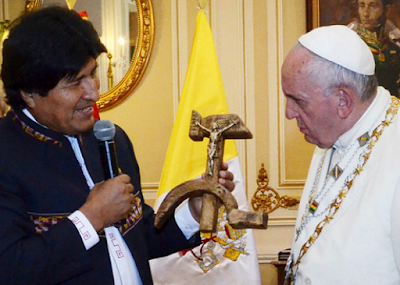 I can perhaps imagine Morales not thinking things through to this degree and just wanting to present an object that "promotes Marxism and has something to do with Christ" but I don't want to suppose either that "the Pope did not think things through" or that he agrees with a promotion of Marxism. Perhaps, and it is my best hope, he simply wanted to make an open and accepting gesture by attributing positive meaning to this piece. Even then, I find it difficult to agree.